Rheumatoid arthritis ranks among the chronic diseases with the greatest effect on health-related quality of life and the most substantial socioeconomic impact, and the intermittent nature of the disease can make diagnosis and treatment difficult. The purpose of this course is to educate healthcare professionals about the epidemiology, diagnosis, and treatment of rheumatoid arthritis in order to ensure early diagnosis and improvement in patients' quality of life. In addition, members of the public may use this course to enhance their personal knowledge of the subject matter presented. 1. 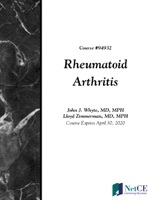 Describe the epidemiology, demographics, and costs related to rheumatoid arthritis (RA). 2. Analyze the pathophysiology and etiology of RA. 3. Identify the associated signs and symptoms of RA, including laboratory findings and implications for differential diagnosis. 4. State the current recommendations for classification of RA according to the American College of Rheumatology (ACR) guidelines. 5. List the benefits and risks associated with pharmacologic RA treatments. 6. Describe the role of surgery and physiotherapy in the treatment for RA. 7. Analyze the role of complementary/alternative therapies in the management of RA. 8. Recognize extra-articular manifestations of RA. 9. Outline the management strategies for patients with RA, including non-English-proficient patients.